We've all seen how unchecked anonymity in social forums can have a profoundly negative influence. But then comes a refreshingly different experience from someone who envisioned a better way through VR - one in which digital anonymity fosters trust and gives voice to genuine and sometimes tender human expression. Grab a tissue and join Lucas Rizzotto, producer of Where Thoughts Go, to learn how he pulled it off. 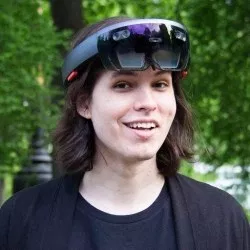 I’m Lucas, an award-winning VR/AR artist, technologist and immersive designer – born in Brazil, raised in the Internet, based in Silicon Valley. Immersive mediums are my thing: I believe they’re the next step in the evolution of media, technology and the human experience. I create magical software around your senses that is both useful and beautiful to use, but also has a much more meaningful goal – to compel its users to become better people. By connecting people emotionally through breakthrough technologies, we enable them them to become more empathetic, intelligent and healthier versions of themselves. Replace addiction loops with growth loops. Create software that’s designed to be transformative, touching and magical. My latest project (Where Thoughts Go) was a fantastical VR social network that allows people to share intimate stories with other strangers through cute audio creatures – it has deeply resonated with people worldwide, winning awards in several countries and making over 20% of its users cry. Humanity is building a new 3D internet and a new way of experiencing the world through immersive computing – my career goal is to ensure that this fantastic era is built under the right set of values, enabling human potential and connecting us more deeply with each other as well as nature.